Preheat oven to 425 degrees. Line a cookie sheet with parchment paper or baking pan and spray with cooking spray. Place the cashews, in the food processor and process until coarsely ground. In a bowl add the nuts stir the cheese, oil, juice and garlic, garlic powder, cayenne and pepper. Place the fish on the prepared 2 inch deep pan lined with parchment paper and divide the nut mixture over the tops pressing into each fillet to make sure it adheres, sprinkle with bread crumbs last. Pour soy sauce, olive oil around the fish not touch the topping and Bake until the fish flakes easily when pierced with a fork. Four pieces at approximately 1/4 inch thickness took 11 minutes. That sounds so good! I need real inspiration to be interested in fish, and this recipe has really done it for me. I can't wait to try it! Thank you! I love fish with a nut coating. Nuts give you extra crunch and flavor. I am going to add this to my have to try recipes. Halibut is one of my favorite fish - love the nut coating. Wishing I lived in FL where it is more accessible and fresher. Oh Claudia, This sounds absolutely heavenly. Hibby would probably kill for a piece:) Beautiful photos too GF! This looks like such a wonderful recipe. The sort of thing you can make for an impromptu dinner with friends or even for a mid-week meal. Love the versatility and rather intrigued by the addition of soy sauce! I would love to have a bite right now...and it is just early morning. That crust looks amazing. I love fish with cashew, walnut and pecan crusts...this is lovely! Claudia, you've done it again! Cashews! That has to taste absolutely delicious. Yum! I never would've thought of cashews with the fish. Thanks for the recipe! Oh wow, I really like that recipe! It's my kind of crust for fish. This looks very good, but I'm curious about the soy sauce, which is a strong taste. I'm going to try it as written. Cashews are such a great pairing with halibut, they look amazing! I love your cashew crust! I bet it would be great on chicken too! Bookmarking this one. Looks incredible. This looks so good, Claudia! I love halibut and that cashew crust sounds fabulous!! Oh wow, what a great idea! 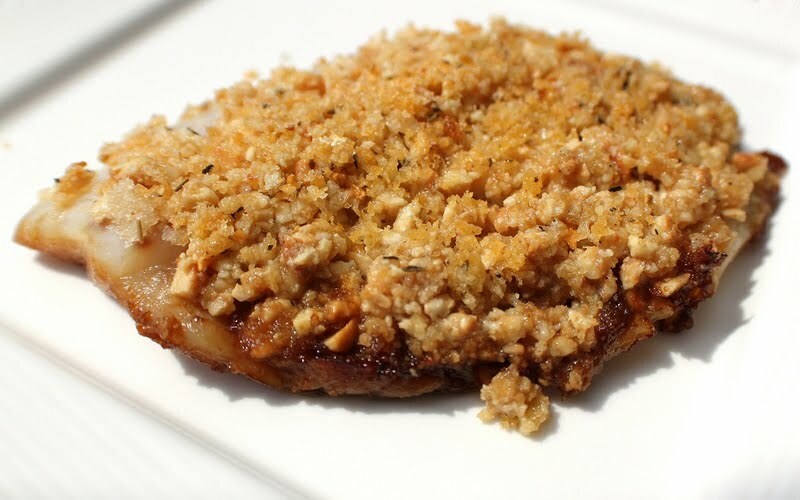 I love that you crusted the fish with nuts. I have never done that before...looks yummy!